Sell Your Home in Under 30 Days or We'll Buy It ... GUARANTEED! 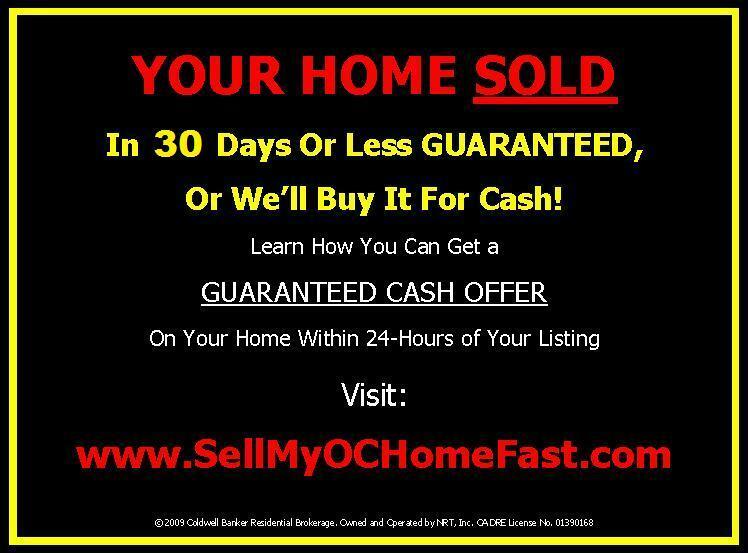 Your Home SOLD in 30 Days or Less Guaranteed, or We'll Buy It For Cash! Learn how you can get a guaranteed written offer on your home within 24 hours of your listing. This written GUARANTEE* will give you the assurance that if your home doesn't sell within 30 days, we will buy it for the upfront guaranteed amount, in CASH. Simply click on the link below to find out how you can sell your home for CASH, Guaranteed! There is absolutely No Cost or Obligation. Click here to begin. Call James & Margret Today! With them, you'll sell your home with confidence, knowing that you got the highest price for your home. Also, don't forget to ask them about special property tax advantages for Seniors too.